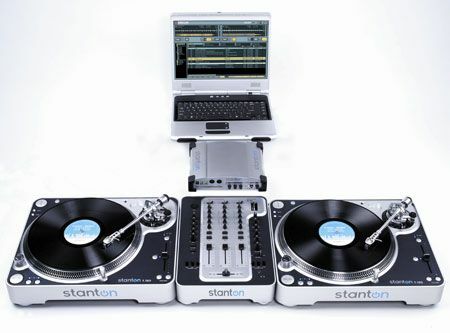 The setup to use a DVS DJ system is very similar to a standard DJ setup. You'd need at least two decks and a mixer, but with the addition of a soundcard that sits in the middle of the decks and the mixer. The sound from the decks would plug into an input port on the sound card, then an output port would be routed on the soundcard to link the computer's replacement audio, from the music file on the laptop, to the mixer channel for that deck. Then the same loop is repeated on the other deck (audio in from deck to computer, and replacement audio out of computer into the mixer channel). DVS is promising to Evolve! As of 2018, there is a new exciting technology that theatens to replace the need for special vinyls or CDs for DVS DJ software. Phase is a wireless solution that doesn't require special vinyls or CDs, and may also eliminate the need for powerful sound cards. There isn't much information available about Phase yet, but we're keeping a close eye on it as we'd love to see exactly how powerful it will become.